Born in Jackson, Michigan, February 7, 1932. He was the first son of Merrill and Helen Worden, and has three brothers and two sisters. Grew up on a small farm and attended a one room country school until entering high school. Now retired from the US Air Force, NASA and BFGoodrich and living in Vero Beach, Florida and at Thousand Oaks Golf Club in Grand Rapids, Michigan. He has three daughters; Merrill, Alison and Tamara. He is the author of a book of poetry, a children’s book and an autobiography, “Falling To Earth”, that was a best seller. Academic: Attended primary and secondary schools in Jackson. Graduated from the United States Military Academy at West Point in 1955 in the top 10% of the class. Returned to graduate school at the University of Michigan in 1961, graduating in 1963 with a Masters Degree in Aeronautical/Astronautical Engineering and a Masters Degree in Instrumentation Engineering. Received a Doctor of Science Degree (Honorary) in Astronautical Engineering in 1971 from the University of Michigan, and a Doctor of Laws Degree (Honorary) in 1995 from Northwood University. 1955-1961 95th Fighter Interceptor Squadron, Washington, DC. 1961-1963 University of Michigan graduate school for Aerospace Engineering, as part of the Air Force Civilian Institute Program. 1963-1964 Empire Test Pilot School in Farnborough, England. Graduated 2nd in the class and received the McKenna Trophy. 1964-1966 Instructed at the USAF Aerospace Research Pilots School at Edwards AFB, California. Applied for the NASA Astronaut Program in December 1965. 1966-1972 One of nineteen astronauts selected by NASA in April, 1966. 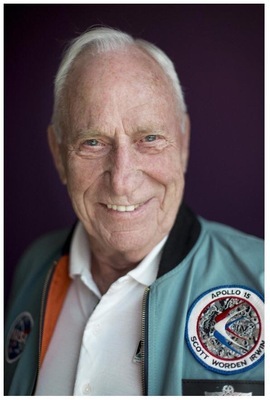 A member of the support crew for Apollo 9 and a back-up crew member for Apollo 12. Served as Command Module Pilot for Apollo 15 (July 26- August 7, 1971) with Dave Scott and Jim Irwin. Apollo 15 was the fourth manned lunar mission, the first to operate a Scientific Instrument Module in lunar orbit, the first to place a satellite in lunar orbit, the first to carry a lunar rover to the surface of the moon and acknowledged as the most scientifically oriented flight of the Apollo program. On the return to earth, performed a spacewalk (or EVA- Extra Vehicular Activity) to recover film from the Scientific Instrument Module, the first EVA while not in earth orbit. On the flight, logged more than 295 hours flight time and covered a distance of nearly 1.4 million miles. 1972-1975 NASA Ames Research Center, California, Chief, System Studies Division. 1982 Ran for the United States Congress in the twelfth district of Florida. 1984- 1989 Owned and operated a helicopter sightseeing operation in Orlando, Florida. 1985- 2004 President, Maris Worden Aerospace, Inc., formed with John Maris to develop an Aerodynamic Performance Monitor and Stall Warning System for aircraft. 1990-1993 President, Jet Electronics and Technology, Inc., a subsidiary of BF Goodrich. JET is a manufacturer of avionics products with gross sales of approximately $ 50,000,000. 1993-1997 Vice-President, Technology Acquisition and New Business Development, BF Goodrich Aerospace, Brecksville, Ohio, primarily responsible for the acquisition and development of high temperature polyamides and Microelectromechanical ( MEMS) devices. Resulted in BFGoodrich buying the MEMS Company. Chairman of the Board of the Astronaut Scholarship Foundation. The ASF is a non-profit foundation, formed by the Mercury 7 astronauts to provide scholarships to outstanding students. The Foundation currently gives over $400,000 a year to worthy students. 2010-2017 Retired. Working on two books for publication in 2019, the 50th anniversary of Apollo 11. Honors and Awards: Numerous awards including the 1972 Collier Trophy, the VandenBerg Trophy, The Kitty Hawk Award, the AIAA Haley Astronautics Award, the UN Peace Medal, Silver Star, Distinguished Service Medal, Order of Leopold, and others. Represented the President during six European & East European Tours 1971-72.